This year, ClimateWise is celebrating 19 years of serving the Fort Collins business community! Please join us as we recognize ClimateWise Partner’s for their 2018 successes at Envirovation, Thursday, April 25 from 3-5 p.m. at the Drake Centre. There will be food from Juli y Juan's Kitchen, donated beverages from local breweries, live music by Cactus Cat, games, prizes, networking and more! Get Your Free Exhibitor Booth! 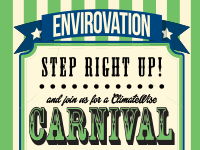 We are giving away a limited number of exhibitor booths at Envirovation to encourage our partners to showcase their businesses and network! If you are interested in having a booth, please contact Danika McIntire, dmcintire@fcgov.com, for more information. 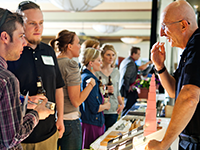 Exhibitor booths will be awarded on a first-come, first-served basis. Are You Ready for Irrigation Season? 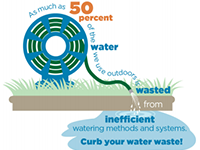 Up to 50 percent of outdoor water use is wasted due to inefficient use. Waiting to turn your system on until May 15 can reduce your outdoor water use by 8 percent and save thousands of gallons. Take advantage of the Landscape Budget Program to ensure your irrigation system is running efficiently and avoid unnecessary Excess Water Use surcharges. 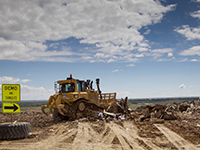 After more than 50 years of service, the Larimer County Landfill is forecast to reach capacity and close by 2024. The next step for Fort Collins’ participation is to consider signing the intergovernmental agreement, a foundational document that clarifies how the communities will work together. Fort Collins City Council will be considering it soon, so now is the time to share your opinion. Exterior lighting rebates have never been better! 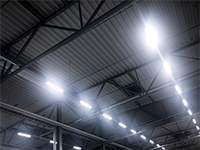 Efficiency Works is paying $1/watt saved for LED fixtures, plus $0.25/watt for completing the project by Nov. 15. Call your contractor to get an estimate. Visit fcgov.com/lighting-efficiency for more information. It’s FREE! Schedule a building assessment and we’ll help you identify and implement the best opportunities to improve your building’s efficiency and save money. Visit fcgov.com/facility-assessment for more information. Efficiency Works also offers multifamily specific assessments, including free direct installs (855-451-4467). This new program requires transparency of energy and water performance in commercial and multifamily buildings. 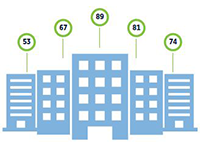 Commercial buildings 20,000 square-feet and above will lead the way, reporting energy and water scores by March 1, 2020. 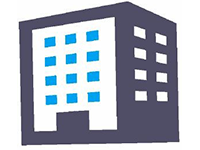 Find out if your building is covered by the ordinance, look for resources and learn how energy scoring can benefit you at fcgov.com/BEWS.